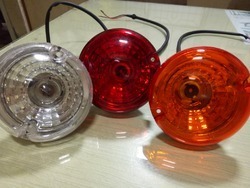 Pioneers in the industry, we offer e rikshaw round light, e rickshaw round light, e rickshaw number plate light and e rickshaw front indicator light from India. we are one of the leading Manufacturer, Supplier and Exporter of premier grade Aircraft Landing Lamps, Aircraft Navigation Lamp, Aircraft Reading Lamp, Aircraft Instrument Panel Lamp, E Rikshaw Round Light, Navigation Light Glass Cover, Aircraft Formation Lamp, Automotive Halogen Lamp, Automobile Lamp, Miniature Lamp, Train Lighting Lamps, Military Tank Lamps, Airfield Lamps, Medical Lamp, Aviation Obstruction Light, HPSV Lamp, HPMV Lamp, Metal Halide Lamp (as per customers' designs & specifications), etc. Lighting Color (As Per Customers' Designs & Specifications), Etc. We are one of the leading Manufacturer, Supplier and Exporter of premier grade Aircraft Landing Lamps, Aircraft Navigation Lamp, Aircraft Reading Lamp, Aircraft Instrument Panel Lamp, Navigation Light Glass Cover, Aircraft Formation Lamp, Automotive Halogen Lamp, Automobile Lamp, Miniature Lamp, Train Lighting Lamps, Military Tank Lamps,E Rickshaw Round Light Approved, Airfield Lamps, Medical Lamp, Aviation Obstruction Light, HPSV Lamp, HPMV Lamp, Metal Halide Lamp (as per customers' designs & specifications), etc. Looking for E Rikshaw Round Light ?